Imagine a world where race no longer mattered. Imagine a world where your socio-economic status had no cultural stimulus to its community or its environmental surroundings. Imagine a world where the only thing that matters is your blood type. 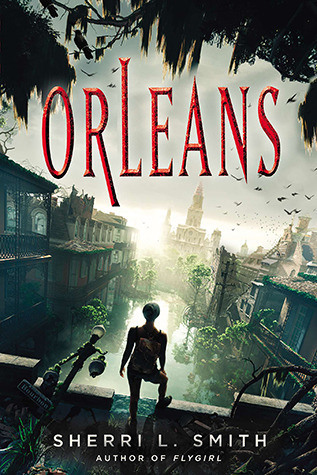 In the dystopian thriller Orleans written by Sherri L. Smith, the author takes us on a voyage led by Fen de la Guerre, a native of New Orleans who has O positive blood. The city of New Orleans is ravaged by a series of hurricanes. Each hurricane has a category higher than the last. After Katrina hit at a category 3, there was Isaiah at a 4, then Olga at a 5, and finally the most devastating hurricane Jesus at a 6. The results ended in a city inundated with a plague called Delta Fever. Anyone who drank or lived within the Delta’s waters became a victim. Fen de la Guerre lives in a blood tribe among others who share her same blood type. The tribe led by its chieftain Lydia, is suddenly attacked by blood hunters who are AB positive. AB positive victims of Delta Fever are the most vulnerable to the disease, and in order to survive they must harvest blood from O positive or O negative blood tribes in order to fight off the virus. Unfortunately, harvesting O blood only lasts for a short time, and it is a constant struggle for one’s existence to maintain a large supply of this blood to sustain a long life. Lydia has come to full term in her pregnancy when she is attacked and gives birth to her baby. Fen is on a mission to fulfill a promise to a dying Lydia that she will keep her baby alive and that little baby Enola born pure will not succumb to Delta Fever. Along the way Fen meets Daniel, a scientific researcher from what is referred to as the “outer states”. Louisiana at this point has been fully barricaded by the U.S. government and deemed unsafe and illegal to enter. Daniel manages to sneak his way in with a resolve and purpose to find a cure for Delta Fever which he feels confident he is able to discover. Fen and Daniel meet serendipitously and the two fight danger, death, and destruction each on their own collective mission to stay alive. Fen’s narrative is told in a deep southern New Orleans vernacular that can be jarring to the reader at times. The narrative alternates between both protagonists Fen and Daniel; who recalls the events of their past and narrates the present. Daniel has a naïve sense of how to be tactful when he conducts his operation to find a cure behind the Wall. The author Sherri L. Smith is the author of four award-winning novels—Lucy the Giant, Sparrow, Hot, Sour, Salty, Sweet and the California Book Awards Gold Medalist Flygirl, which the Washington Post named a best book of the year. Her novel was the first selection of the Blerd Book Club on Goodreads which launched in June of 2013. The Blerd Book Club was started by Cynthia Lanel. It is a book club for blerds, nerds, bleeks, and geeks to discuss, review, and reflect on the books they love. This month’s selection for July through October is the Patternmaster series by Octavia Butler. To find out more about the Blerd Book Club you can follow them on Twitter @blerdbookclub. November 3, 2013 We Won! Black Weblog Awards Announced Yesterday! January 17, 2014 Book Review: Before I Forget by Leonard Pitts Jr.
Next story Rapper Juicy J Wants You to ‘Twerk Something’ to…College? The 2016 Oscar nominations are proof that the Academy doesn’t care about you. A Beyoncé Documentary? Is This Just Her Effort to Seem More Human?